SarahM is an exclusive salon for womenâ€™s beauty and aesthetics. With us it is all about pampering, relaxation and rejuvenation. Walk out a new woman! Eyebrows & Eyelashes Tints enhance the look of your eyebrows & eyelashes making them appear thicker, fuller and darker. Crystal Clear Microdermabrasion Facials Crystal Clear has fast become the most talked about facial as it offers a safe and controlled method of skin resurfacing by gently exfoliating the outer layers of skin. An excellent and progressive treatment for ageing skin, lines and wrinkles, open pores, blackheads, pigmentation, blemish scars, acne scars, stretch marks and much, much more. Facials Our facials will boost your skin's texture leaving you with a softer & more youthful complexion. Radio Frequency Treatment This is a non surgical facial treatment to help improve signs of skin loosening or sagging around the face. Airbrush Makeup / HD Makeup Immaculate - Detailed - Perfection. 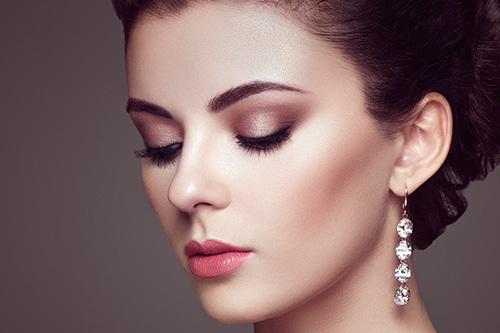 We aim to create a truly stunning look to suit you and the occasion. Asian Bridal Makeup Our Asian bridal makeup is the difference between a beautiful bride and a truly stunning bride. This is the creation upon which we work to create that truly stunning bride. A prior consultation is highly recommended to ensure that the Asian Bridal Hair & Makeup perfectly complements the dress, colours and even the venue. Normal Waxing Sarah M Beauty offer a wide selection of 'normal' waxing options. With a holistic approach to beauty treatments, SarahM reflects a dedicated, professional expertise with a personal touch. We offer a full range of exclusive beauty treatments from award winning Skin Care Services, Microdermabrasion from Crystal Clear, Lycon Wax Treatments, Non-Surgical Skin Treatments, Galvanic Micro-Current and RF, Airbase, Eyelash and Eyebrow Tinting, IPL/Laser and more.